Attracting birds to your backyard provides hours of enjoyment for people of all ages. Successful bird gardens have three basic requirements: food, water and shelter. Tube Feeder — attracts tree feeding birds such as chickadees, nuthatches, woodpeckers, finches and titmice. Use sunflower, safflower and nuts. Finch or thistle feeders are tube feeders with small narrow holes that allow finches and siskins to remove the Nyjer (thistle) seeds and prevent larger beaked birds from eating at the feeder. Peanut feeders have very large holes to accommodate the nuts. Ground/Platform Feeder — flat tray feeder that attracts ground feeding birds such as doves, juncos, cardinals and robins. Use mixed seed with millet and sunflower or cracked corn. Hopper Feeder — a seed storage bin that either mounts on a pole or post, or hangs from a tree or structure. Hopper feeders attract both tree and ground feeding birds. Use mixes high in sunflower. A steady supply of water, using bird baths, ponds and waterfalls, is often just as important as food when creating a bird habitat. The sound of moving water is especially attractive to birds. If you don’t have a waterfall, consider incorporating a fountain into your landscape or install a small pump in your bird bath. During extended cold periods when lakes and rivers are frozen, birds may have difficulty finding an adequate supply of water. Help your bird population by using a bird bath heater or a pond de-icer. These units are thermostatically controlled to shut off automatically when the water is not frozen or if the bird bath runs dry. A diversity of plant life in your landscape provides birds with shelter from the elements and from predators. In a sheltered garden, birds also find places to eat, nest, roost, court, preen; and find food such as insects, fruits, seeds and nuts. Keep this in mind when selecting plants for your garden and when deciding where to place bird feeders and bird baths. 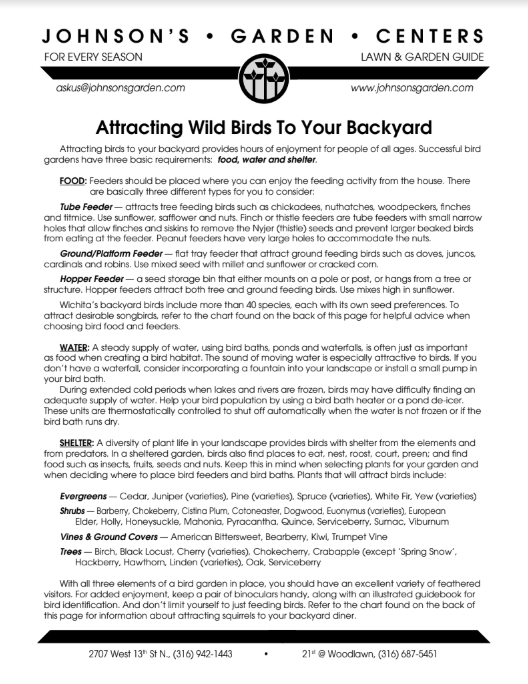 With all three elements of a bird garden in place, you should have an excellent assortment of feathered visitors. For added enjoyment, keep a pair of binoculars handy, along with an illustrated guidebook for bird identification. Wichita’s backyard birds include more than 40 species, each with its own seed preferences. 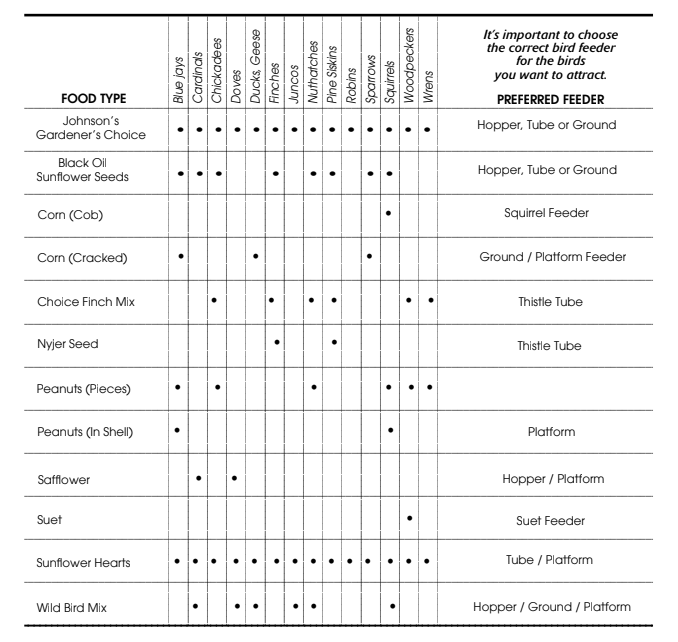 To attract desirable songbirds, refer to the chart below for helpful advice when choosing bird food and feeders.